Sarah from Maisy Day Handspun and I have some wonderful new yarns and fibers to add to the shop today. 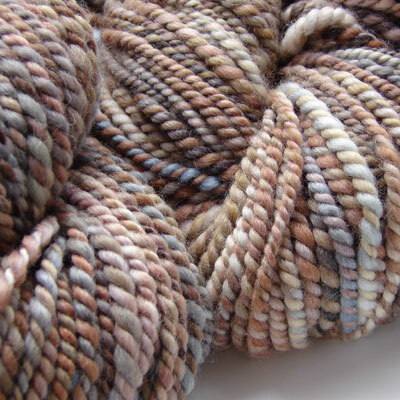 Sarah sent hand-dyed sock yarns and some gorgeous plump skeins of bulky 2 ply handspun wool. I dyed up a mountain of Fat Sock for all that baby gear we’re all knitting, plus cushy socks, if you’re thinking ahead to winter (or wishing for it like I am!). There’s some Sock in semi-solids for your sock patterns with textured stitches, plus some bright multicolored Sock, as well. 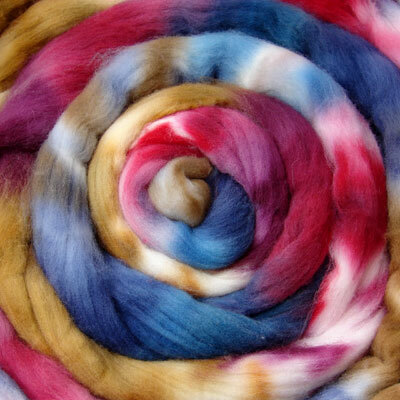 I also dyed up Bluefaced Leicester, Shetland, Merino, and Superfine Merino wools for spinning. Thank you for all the lovely comments on the booties. I’ve started another pair in the round. They’re considerably fiddlier to knit, but not bad, and I very much like them seamless. Photos and a write-up of my mods to come as soon as they’re finished and I find tiny enough buttons. it’s 2:15, please tell me that the fat sock yarn just hasn’t gone up yet, and it’s not all sold out already! Man, I just love your fiber and yarns!! I think I need to learn to spin, every time I see you fiber the itch gets worse. Why are you doing this to me? Dang, missed it again! That’s what I get for going on vacation. Oh well, I can console myself by knitting on my Blows Smoke merino money socks. Loved the spinning of it, loving the knitting of it. How is the tomten jacket coming along???? I find little kids’ tomten jackets slow to knit for some reason…and can’t imagine an adult version is easy.